The Moriond conference offers us updates on many searches in particle physics although the most interesting findings may be stored for later and larger conferences. Matt Strassler has mentioned an interesting new exclusion plot based on the newest CMS multilepton events. It shows an excess that Matt considers weak relatively to the expectations based on our hype a few months ago. I don't think that Matt's current pessimism is quite justified. There have been many TRF articles on multilepton (and multijet) searches, see e.g. this January 2012 article on ATLAS for links to other similar TRF blog entries. But the most similar older article about an excess that is almost directly comparable to the new plot was given in one particular TRF article. 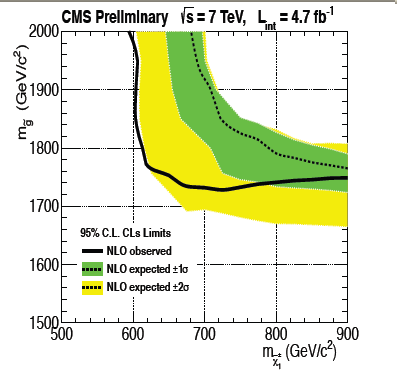 In that October 2011 article, I discussed this CMS preprint and mentioned that some limits were 1.0-1.5 sigma weaker than expected which indicated excess events and a hope for new physics. This picture was a part of my discussion. The excess based on 2.1/fb of data wasn't terribly impressive but you could have been intriguied by it, anyway. The yellow dotted line indicated that the CMS should have had (=was expected to have) excluded e.g. the point with a 1740 GeV gluino and 700 GeV chargino but something – either noise or new physics – has prevented the CMS folks from excluding this point, among others. My previous sentences were just a contrived way to say that you could have decided that the 1740 GeV gluino with a 700 GeV chargino point could have been a plausible option with some modest support in the data. However, if this optimistic interpretation of the mild excess were right, you would expect the excess to increase with additional collisions. We possess some of them today. Instead of October's 2.1/fb of collisions, the CMS has already evaluated (in a preliminary way) 4.7/fb of data which is 2.24 times more than the previous figure. Take the square root of this ratio and you get almost exactly 1.5. That's the factor by which you would have expected the excesses to grow if they were real. So a 1.5-sigma excess in Fall 2011 should have grown to 1.5 times 1.5 which is 2.25-sigma excess. If the excess were due to noise, you would have expected the excess to decrease approximately by the same factor of 1.5, i.e. to 1 sigma, because the new events are expected to be "neutral" in average. Fine. So what do the new 4.7/fb data from CMS actually show? And make no mistake about it: points like a 1740 GeV gluino with a 700 GeV chargino are still alive even though they should have already been killed in October 2011, just with 40% of the currently available data! Don't get carried away by 2-sigma excesses but there's some very modest new evidence that something new could be going on. The probability was way over 90% that with the new data, the excess in the number of sigmas would weaken. Instead, it grew exactly as expected if this excess were caused by a signal. It's plausible that this overall exclusion plot actually understates the strength of the signal much like it did five months ago. It may even sound natural to expect that the other "formats" of the data that suggested some multilepton excesses and that looked stronger than 1.5 sigma back in Fall 2011 (i.e. the overall numbers of various events in a few bins etc.) have actually grown as well so they may have become very visible by now. However, we don't have the updated data from the other articles yet. That's why a 1740 GeV gluino with a 700 GeV chargino mostly remains a dream, with some very weak hints that we're actually not sleeping right now. ;-) Don't forget that the amount of evidence we have would be enough to execute all the deniers and their families in the climate science but in the actual science, the evidence of new physics is still very weak at this point. Has Anton Zeilinger created a time machine? Who should be celebrated for the God particle? Is the neutrino mixing matrix an involution?